• Add low cost Safestor Tenant Insurance to your account, simply click the button called Get Safestor storage protection now when you log in. • Sign up for Automatic Payments, FREE Rent Reminders and More! They have everything you could hope for out of a Storage unit, plus some! The staff is extremely helpful and knowledgeable. 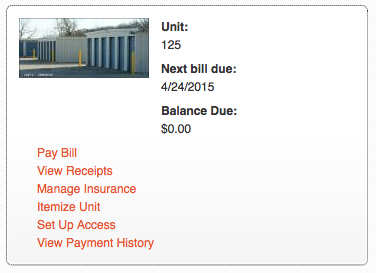 I was able to access my unit any time day or night and it made our move very easy. I will definitely be using them again and would recommend them to my family and friends. Good work Storage Authority!